Horror directed by Dario Argento and starring Leigh McCloskey. American student Mark Elliot receives a letter from his sister Rose, who thinks her New York apartment has links to an ancient coven. But when Mark arrives in the Big Apple, Rose has disappeared and a series of occult killings are gripping the city. 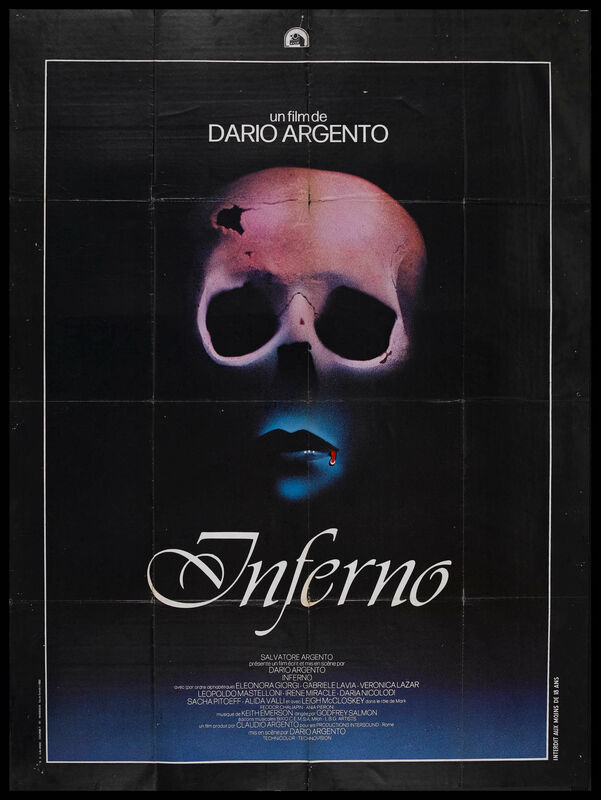 Inferno is like a crash course in Argento's themes and stylistic devices crammed into a rather ill-fitting 102 minutes. There is a story - but while, on the surface, it appears mysterious, complicated and inter-connected, in reality it's little more than an elaborate peg from which to hang some brilliantly composed and constructed set-pieces. What you do get, however, are a series of beautifully composed shots lit in vivid red, deep blue and off-kilter green. There's very little in the way of natural light : almost every scene is an interior and those set outside tend to be at night, more often than not during a vicious rainstorm and in one case during a lunar eclipse. The film is thematically linked to Argento's previous release, the genre classic Suspiria (1977) - as the story once again focuses on houses that hide dark secrets and the misfortunes of those innocents who stumble into the lives of those who inhabit these homes. As usual with films dubbed into English there is alienating distance between the scenes of dialogue and the viewer : an actor's mouth clearly forms the word "Giovanni" but "John" is heard on the soundtrack. In the case of Inferno though this alienation only serves to add to the sense of dislocation which is the predominant tone of the film. When the film steps up a gear is in the directors delivery of set-pieces - an early scene set in a mysterious flooded underground room is extraordinary in terms of the technical skill involved and when the pay-off comes it's effective and well handled. Argento then reprises this trick throughout the film : every fifteen minutes or so there's a set-up for another gruesome murder that's handled slickly and with enormous care to ensure the combination of mood, tone and look all combine to deliver the maximum shock. Keith Emerson contributes a pounding neo-Gothic keyboard and orchestra soundtrack which effectively counterpoints and underpins the on-screen action. At the time of its release far too many horror films were content to rely solely on visceral shock and the opportunities offered by advances in make-up special effects : Inferno stands out because of the obvious care taken over its construction and the fact that is beautifully shot with some extraordinary images in among the carnage. Best to view it without taking too much notice of the plot and just let Argento's fabulous compositions and colour scheme wash over you.